Organize tangled power cords in your rack. Installation is fast and easy-just bolt onto the cabinet rails, plug equipment into the strip, then plug the strip into an AC outlet. Other models include a switchable strip with rear outlets (PS186A-R2), and a switchable strip with front outlets (PS189A-R2). Get rid of that snake pit of power cords behind your rack. A power strip from Black Box can help to keep your rack neat: Plug all your rackmounted components into a central location. Choose strips with or without surge protection. 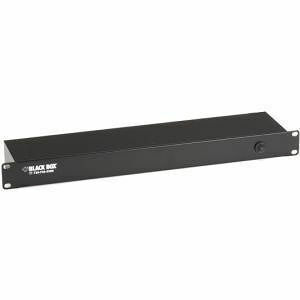 The 19" Rackmount Power Strip is easy to attach to the rails in a standard 19-inch rack, providing six outlets. This strip is switchless, so you can't accidentally trip the Reset/Power switch.